Visiting one of legendary skincare name, Aesop’s New Zealand stores is always a treat – a riot for the senses and a good way to discover more about the beautiful brand. Aesop is not your regular high-end skincare, haircare, home fragrance and more company. There are no big promises, no celebrity endorsements, no glossy packaging and no advertising. As a brand, they are committed to celebrating science by integrating both plant-based and laboratory-made ingredients, and the efficacy of their product formulations is world-renowned. Therefore, when they unleash something new upon the market, chances are it will be stellar, and an immediate must-have. 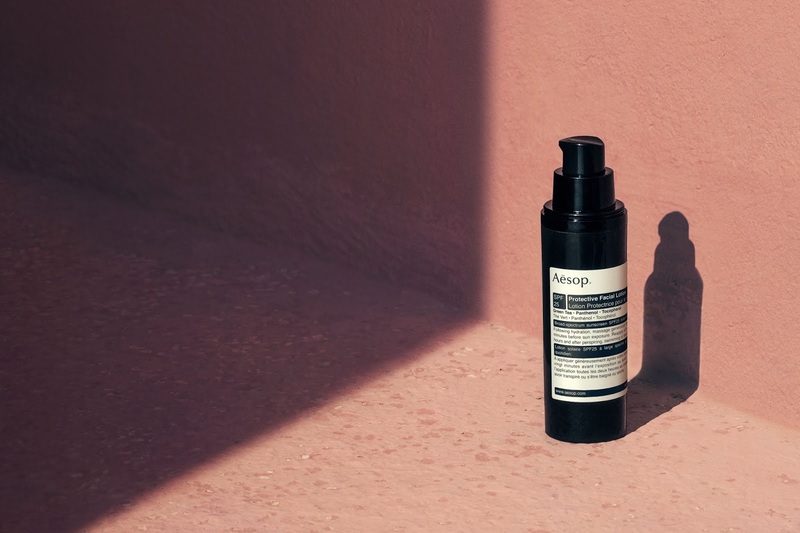 The latest formula to land is Aesop’s new Protective Facial Lotion SPF25, a hydrating moisturiser with antioxidants that offers broad-spectrum protection against UVA and UVB rays. In addition to helping shield skin from the damaging effects of sun exposure, the hydrator contains Green Tea and Tocopherol (Vitamin E) to deliver antioxidant benefits and keep your skin protected and nourished. The formulation also contains skin-soothing Panthenol, which works in concert with light yet nourishing emollients Coco-Caprylate and Squalane to hydrate and soften the skin. The result of three years dedicated research and development; the carefully constructed formulation delivers a breathable texture without a weighty finish and is designed for daily use. After a few days of application I have to say it’s a joy to use, and thus far, not a hint of sunburn or sensitivity has reared its ugly head. To use, massage generously from forehead to neck, 20 minutes before sun exposure. Reapplication is advised every two hours onwards, to ensure comprehensive UV protection through the day. While I’m here I also have to give a shout out to a couple of Aesop’s other sun-focused formulas, which I have been using for a while now. The Protective Body Lotion SPF50 is one of my favourite blocks, a broad-spectrum moisturising sunscreen with high protection that was formulated to provide up to four hours’ water resistance. Follow it up at the end of the day with their Petitgrain Reviving Body Gel, an after-sun hydrator enhanced with Aloe Vera and Panthenol to soften and soothe, and extracts of Petitgrain, Grapefruit and Lemon to cool, balance and refresh the skin. Just gorgeous. The new Protective Facial Lotion SPF25 is packaged in a 50mL bottle and is available at Aesop Signature Stores, select department store counters and at aesop.com right now. RRP: $73 NZD.